They come with names that sound like 1970’s rock bands… Bodega Red, Arran Victory, British Queen, Golden Wonder, Bellarosa. Or like types of prize-winning chickens… German Butterball, Champion, Adirondack Red, Tyson. Some even sound like certain breeds of dairy cows… Shetland Black, Royal Jersey, Blue Bell, Annabelle, Cream of the Crop. But today we are not talking about chickens or cows or headliner music. Instead, today we are talking about potatoes. All those names previously discussed are specific types of one of the most consumed foods on the planet- the noble and nourishing potato. 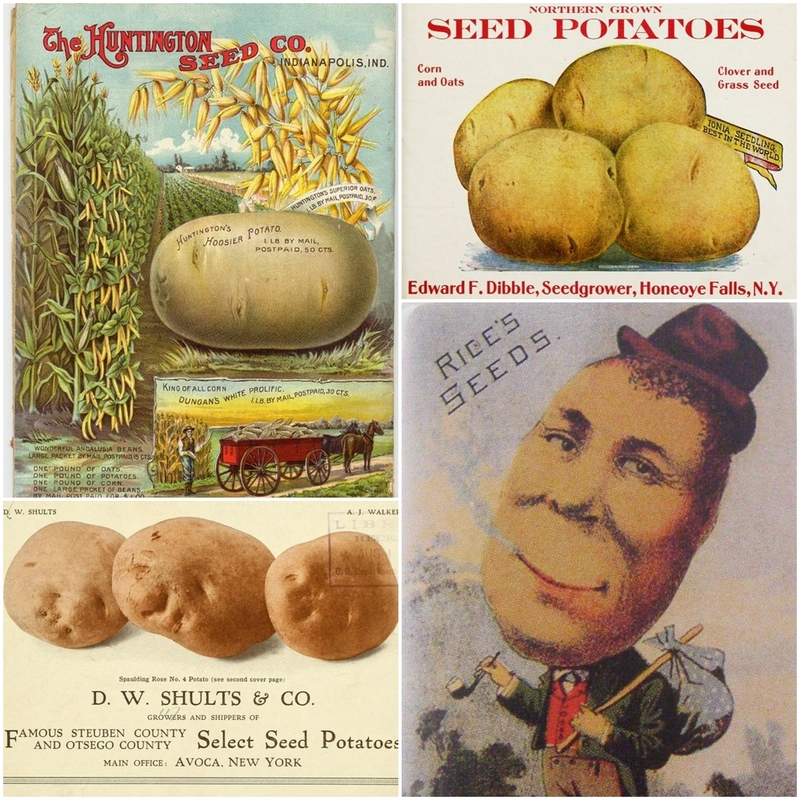 With more than 5,000 varieties in the world, you might think that it would be hard for one lone potato type to stand out in his vast tuber family of brown, round, knobby eyed dirt dwellers. But there is actually one big-time celebrity in the batch – a spotlight stealer known around the world – a superstar of the food and restaurant scene that represents the most frequently consumed potato on the planet. It is my pleasure to present the story of the wondersously addictive potato variety known as the Burbank Russet. Haven’t heard of it, you say? Ah, but just you wait…you’ll know it. Maybe not by backstory but definitely by bite. Luther grew up in Massachusetts in the 1850’s playing with seed balls in his mother’s garden instead of playing with sports balls in his farm neighborhood. His interest in botany from the time he was a youngster fueled his curiosity for plant cultivation, a field of study that would eventually turn into a lifelong career. Throughout his childhood and into early adulthood, Luther tinkered around with seed starting and plant breeding. Although it was a laboriously slow process, most often times ending up in disappointment, Luther came by this area of study naturally. His mother also shared his interest in gardening and the two of them would happily spend hours working in the garden, talking about the life stages of various plants. The plant world was a playground to Luther, something that represented creativity and freedom from set rules and rigid disciplines. 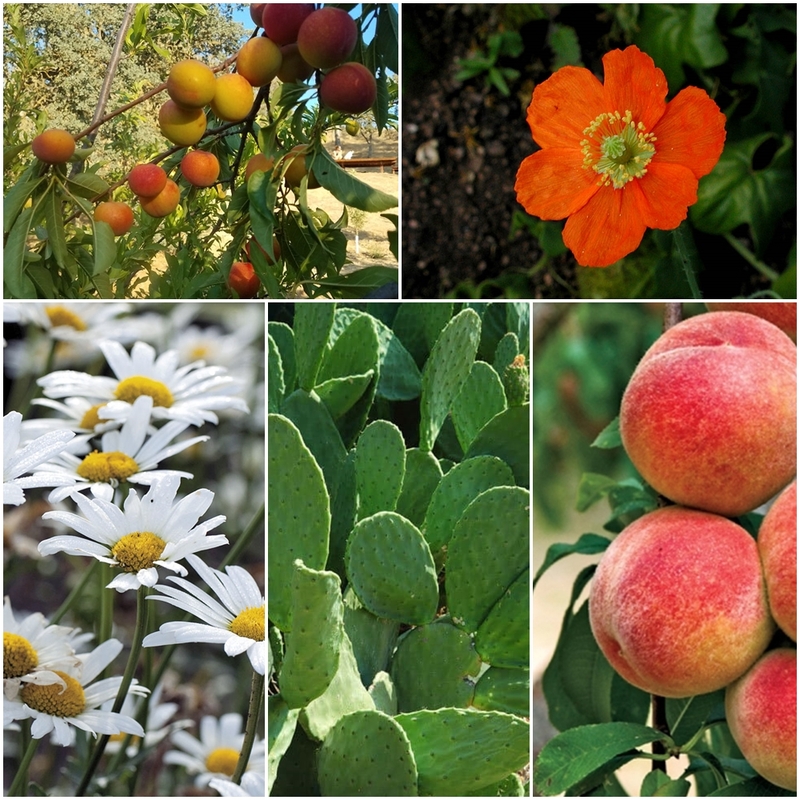 He had aspirations to one day have his own farm in California where he would grow vegetables and flowers for the retail market and try his hand at growing new breeds of plant life. 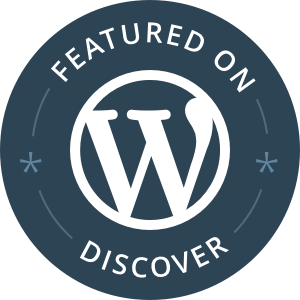 In his early 20’s, he started experimenting with potatoes. But developing a new variety wasn’t as easy as you might think. Potatoes are peculiar things. They can be regenerated in two ways – through seeds or eyes. Either method produces similar results or slightly different results in the form of mutations or sports each time off-spring are generated. It is difficult to determine at the onslaught of a growing project how the potatoes will turn out at the end of the project. More often than not the experimentation stage for Luther in trying to cultivate a new variety was long and finicky. If you have never seen how a potato grows, this is a good illustration. Plant above the ground and lots of potatoes nestled together below ground. 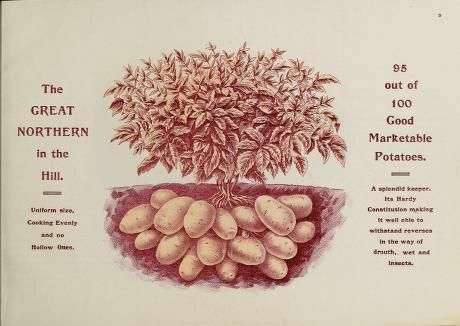 Image from the 1893 L.L.May & Company Seed Catalog featuring Northern Potatoes. But in 1873 gratification came, finally, to Luther’s ruddy, soil-covered hands. One day in his 24th year, Luther went out into the field to dig his latest sample crop, half expecting to uncover the same old story of growing the exact same plant he started out trying not to grow. But this time, something was different. Instead of digging up an ordinary round potato, Luther pulled a tuber out of the ground that was twice as big and twice as long. It was reddish-brown in color and hefty in weight. A totally different specimen than the parent potatoes he had started this most recent batch with. Success at last! His first genuinely original new potato had emerged. He christened this new masterpiece the Burbank Russet and immediately sold it for $125. Was that enough money for Luther to retire early to his California dream farmhouse and garden? Not quite yet, but that’s not important to this story. Money never mattered to Luther, only the science that stood behind it. He made a new potato and that was pretty motivating stuff to keep his heart in the game and his hands in the soil. Luther’s Burbank Russet was an exciting and innovative new addition to the agricultural market for its time because of its size. Almost twice as large as typical potatoes of that era, it also boasted an adaptable consistency (good for baking, mashing and frying) and was more disease resistant to common blights that affected many potato crops around the world. But after it was introduced in the late 1800’s, it took some time for the Burbank Russet to catch on. The US government initially started farming it in Oregon and from there it slowly spread to neighboring states and then the region and then the rest of the country. Eventually, it became the best-loved potato cultivator in the US. Russet potato farmers in 1940’s Idaho. Farmers loved it because it was easy to grow and held up well in both shipping and storage. Once it became a successful and abundant crop, the food industry got on board. Its size, consistency and cooking adaptability made it an ideal food product for both general household consumers as well as commercial food companies and restaurants. Although the actual cooking process of making French fries – cutting strips of potatoes and frying them in fat – had been around in France and Belgium since the 1700’s, it wasn’t until a valuable American discovery was made in the 1930’s that fries started to take hold as an American food staple. This important discovery was that french fries froze well and could be reheated easily while still maintaining the same shape, taste and texture. In the early days of refrigeration, this was exciting! This mere fact opened up opportunities for the retail, transportation and restaurant industries as french fries could now be shipped around the country in both frozen and fresh forms. 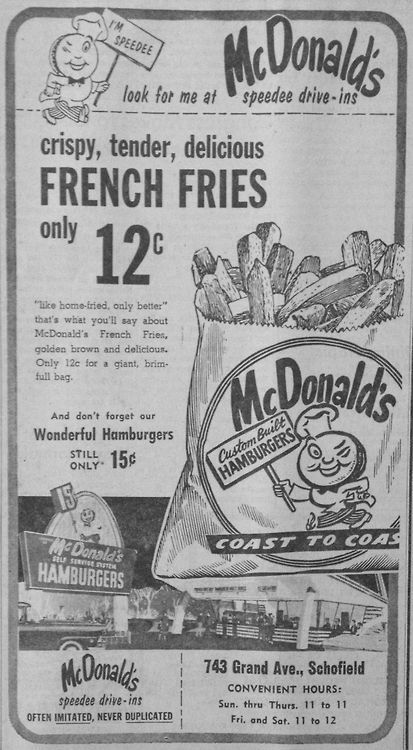 A midcentury newspaper ad for McDonald’s french fries. By the time hamburger stands started popping up in the 1950’s and 1960’s, french fries became a main attraction at the drive-in burger stand as well as the family dinner table. A vintage frozen french fry ad from the 1960’s. Photo courtesy of itsjustoldpaper on Etsy. The novelty of enjoying french fries both at home and at restaurants offered plenty of potential in the form of culinary creativity. 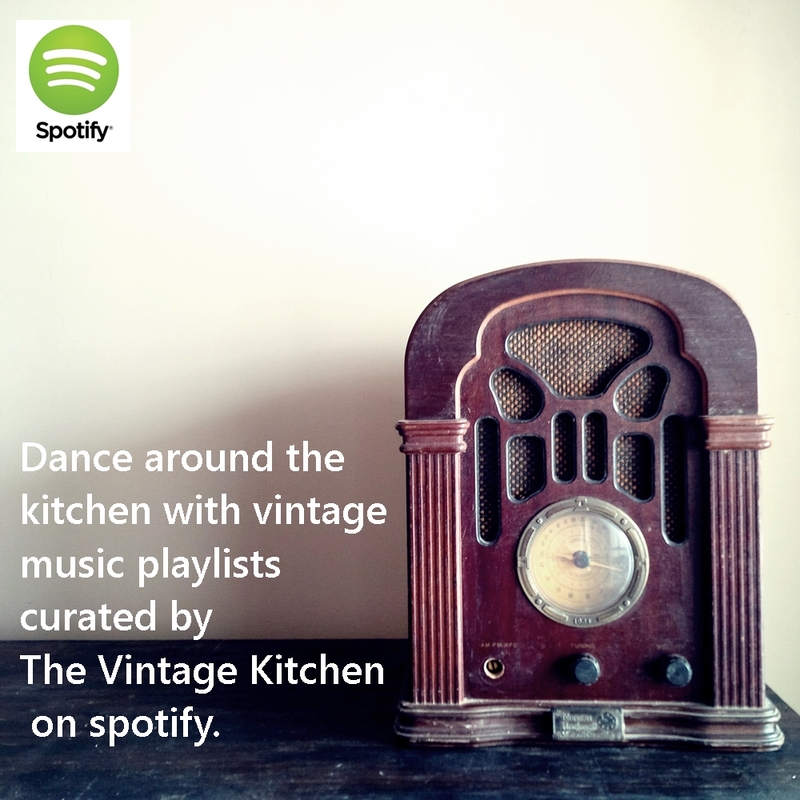 In mid-century America, the common condiments for them were simple… ketchup (or catsup, however you prefer!) and salt. A 1955 advertisement for French Fries featuring Hunt’s catsup. …paprika, cracked black pepper, parmesan cheese, malt vinegar, crushed herbs, ketchup, mayonnaise, mustard, salt and a special mayonnaise/mustard mixed combo variation. In addition to frying, it also became much more commonplace, especially in the latter decades of the 20th century, to oven bake freshly cut fries. This method of cooking was believed to be a “healthier” version since it involved less oil and a tamer cooking experience (no vats of hot fat to contend with!) as opposed to traditional deep-fry methods. Because a lot of people tend to think it is easier to go to a fast food restaurant and buy a serving or two of fries or grab a box of frozen ones from the grocery store, we made the oven-baked variation for this post to prove how simple, quick and easy it is to take a fresh potato and turn it into a delicious hot french fry in less than 30 minutes. This recipe comes from the Joy of Cooking (1975 edition) cookbook and was a breeze to make. Literally, it took 5 minutes to prepare and 20 minutes to bake, which makes it a fast side dish for your summer burgers. Preheat oven to 450 degrees. Slice potatoes lengthwise into long 1/4″ sticks (you can do this by hand or by using the julienne setting on your vegetable slicer. Either way try to keep each stick as uniform as possible to ensure even baking. Lay the freshly cut sticks between a couple layers of paper towels and pat dry to remove extra moisture, then spread sticks out on an ungreased baking sheet and drizzle with olive oil. Using your hands, toss the potatoes and oil together so that all sticks are coated and spread them back out in the pan as flat as possible. 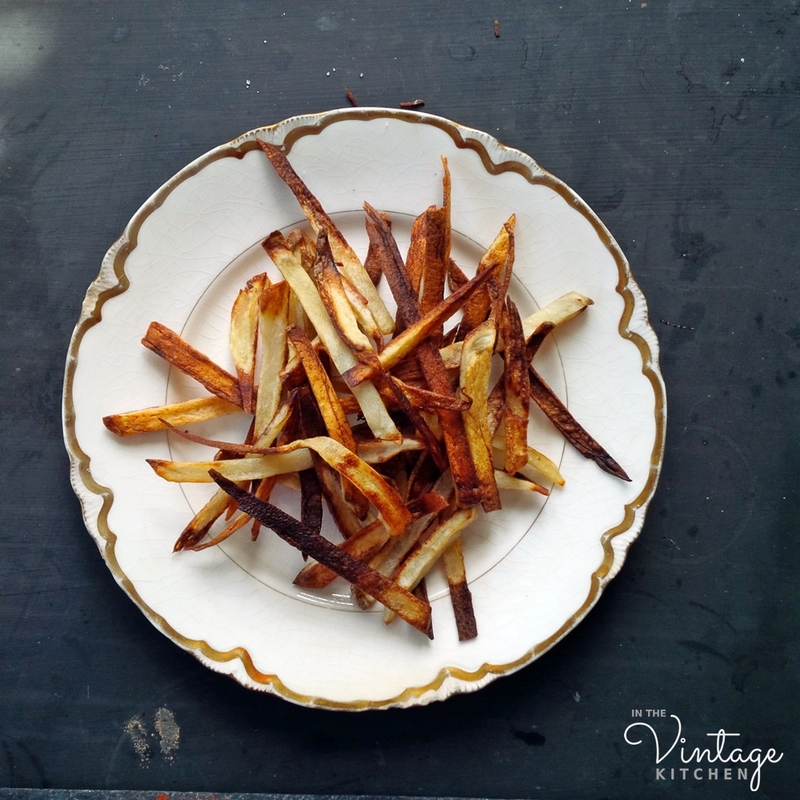 Remove fries from the baking pan onto a paper towel-lined plate. Sprinkle with salt and pepper (or any of your favorite spices) and serve immediately. 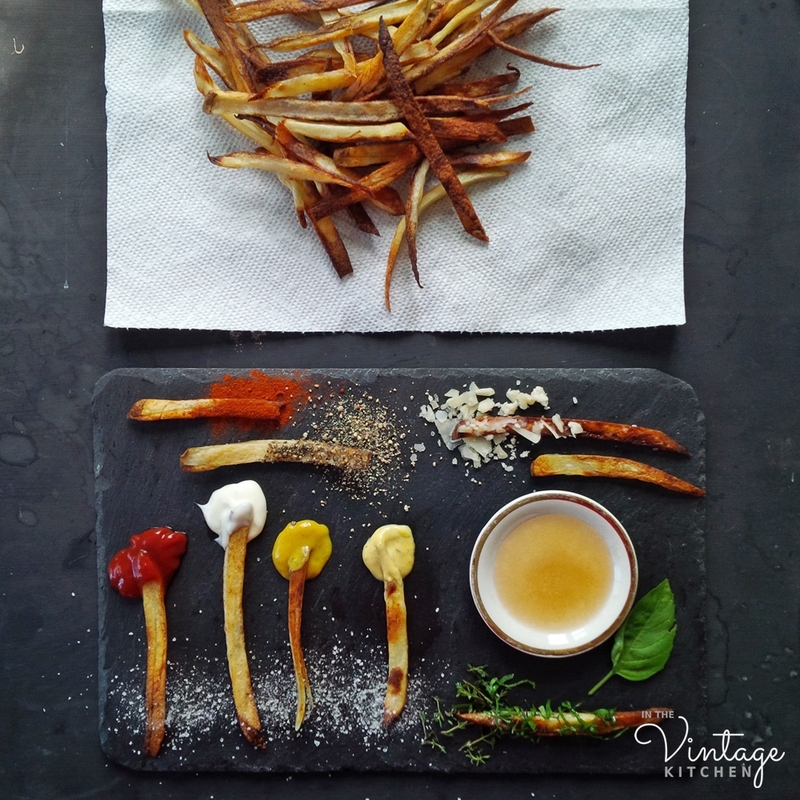 Inspired by the 1970’s list of approved condiments, I kept thinking while writing this post how fun it would be to have a french fry bar party where guests could pick and choose their own toppings from a wide assortment. So many flavors pair well with potatoes, so the possibilities would be endless as far as dips and dredges, sprinkles and submersibles. 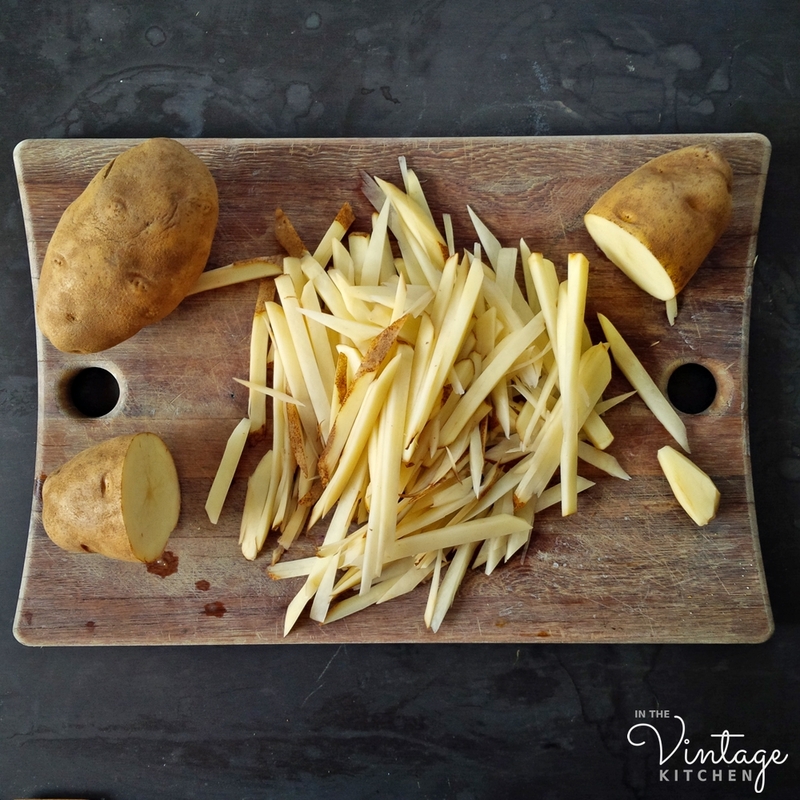 The one element of homemade french fries that should always remain constant though is the potato – always use russet potatoes. They are the variety of choice in almost every fast food french fry you’ll ever eat – including McDonald’s whose fries are legendary. And besides, you’ll make Luther happy, using his version over any other! Now in 2018, his house is a city park and garden that is open to the public. So while he never did see his potatoes bubbling up in oil at the golden arches, he did see his lifelong passion laid out in the golden hour light of each day into night. 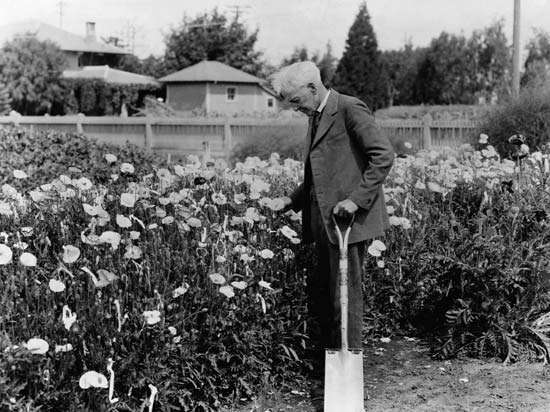 Satisfaction was never going to be found in fame or fortune when it came to Luther Burbank. He didn’t care about either of those two things. His happiness lived deep within the dirt – a vast canvas of potential fueled by creativity and curiosity that never ceased to inspire him. Cheers to Luther for inventing one of the most delicious potatoes in the world. And cheers to all the farmers who keep growing the russets. May they continue to add a bit of indulgence to our diets and serve as a basis for inspiration in our culinary endeavors. 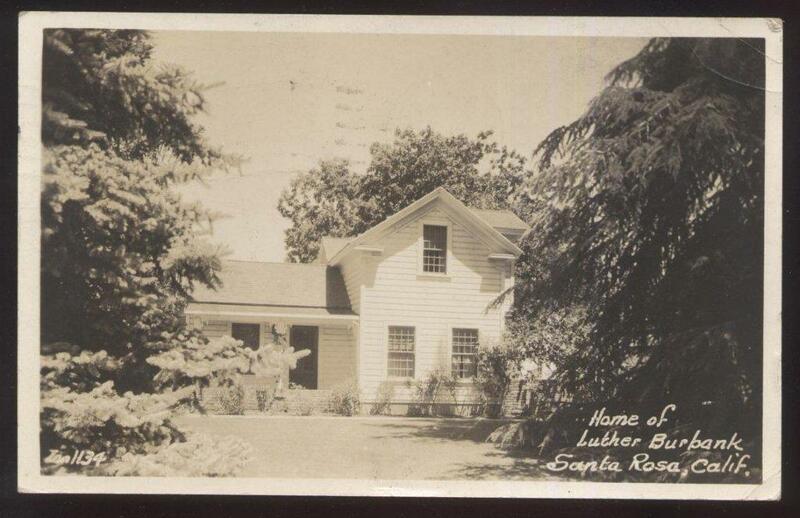 Find out more about Luther and his Santa Rosa, CA garden park here. 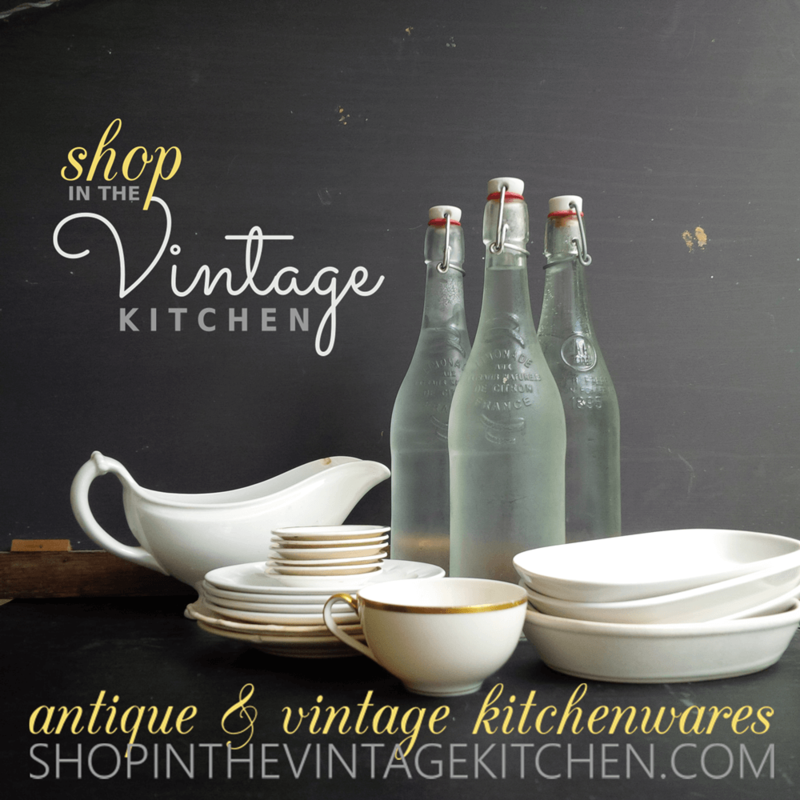 Find the vintage Joy of Cooking cookbook in the shop here. If you guys have any favorite toppings or condiments that you prefer on your french fries please post them in the comments section below. We’d love to hear from you! Oh how lovely! Thank you so much for the extra promotion! It is a marvel, isn’t it? I’m so glad the City of Santa Rosa loves it just as much as Luther did! I live in Santa Rosa and I’ve been meaning to finally tour the house! I’ve driven by it a million times! 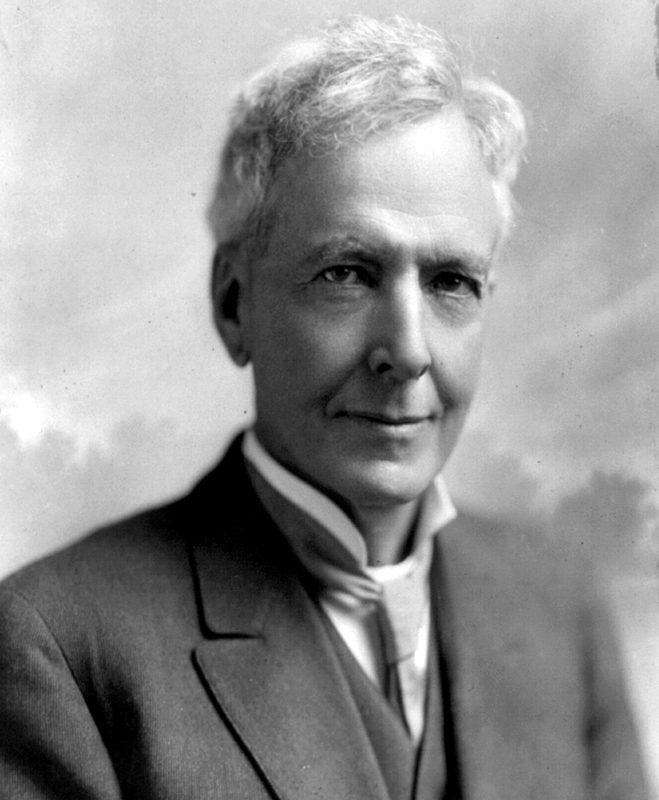 I just recently came to realize how important Luther Burbank was. (before I was too young to appreciate him!) The auditorium at the JC is called Luther Burbank. I was in a play there once. Great vintage ads too. Thanks for sharing. How fantastic that you live in the same town as Luther. I’m glad to hear that you have a newfound appreciation for him! Hope you get to tour his house and gardens soon. We’d love to hear about your experience, so please pop back in and say hello if you get a chance.